Casal Garcia was born in 1939, a year in which the vintage was particularly good. Returning by train from the grape harvest in the Douro, the French oenologist Eugène Hélisse decided to interrupt his journey to Oporto after passing the vines of the Quinta da Aveleda, in Penafiel. Dressed in white, and with a straw hat to ward off the heat of the end of summer, he began to walk towards the property's cellar. He went in, introduced himself and insisted on speaking to the owner, Roberto Guedes. What he had seen minutes before from the window of the train was truly special: the vines were beautifully cared for and the land was divided according to grape variety, everything in French style. This was not a usual procedure in the Vinho Verde region. After a long conversation, Roberto Guedes decided to contract the services of the French oenologist, who had promised him significant improvements in the method of winemaking. The results became evident at the end of the harvest, when Eugène Hélisse took a sample from a wooden barrel and placed it in an old glass bottle. The wine had a beautiful, transparent colour and such a freshness that everyone present was thrilled. Thus, in order to enhance the wine's appearance, he passed a lace handkerchief over the bottle to clean the dust. And there the lace remained! 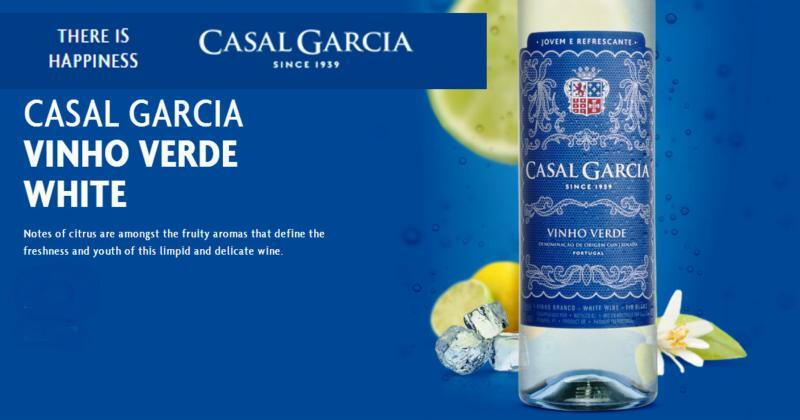 The name came about by itself, since the wine was produced from one of the vines of Aveleda: that of Casal Garcia. Lively colour, with ruby tones, and a fruity aroma including the floral notes of the Touriga Nacional grape. In the mouth, red fruits dominate.Winery notes.